Pyranose is a collective term for saccharides that have a chemical structure that includes a six-membered ring consisting of five carbon atoms and one oxygen atom. There may be other carbons external to the ring. The name derives from its similarity to the oxygen heterocycle pyran, but the pyranose ring does not have double bonds. A pyranose in which the anomeric OH at C(l) has been converted into an OR group is called a pyranoside. The pyranose ring is formed by the reaction of the hydroxyl group on carbon 5 (C-5) of a sugar with the aldehyde at carbon 1. This forms an intramolecular hemiacetal. If reaction is between the C-4 hydroxyl and the aldehyde, a furanose is formed instead. The pyranose form is thermodynamically more stable than the furanose form, which can be seen by the distribution of these two cyclic forms in solution. Hermann Emil Fischer won the Nobel Prize in Chemistry (1902) for his work in determining the structure of the D-aldohexoses. However, the linear, free-aldehyde structures that Fischer proposed represent a very minor percentage of the forms that hexose sugars adopt in solution. It was Edmund Hirst and Clifford Purves, in the research group of Walter Haworth, who conclusively determined that the hexose sugars preferentially form a pyranose, or six-membered, ring. Haworth drew the ring as a flat hexagon with groups above and below the plane of the ring – the Haworth projection. A further refinement to the conformation of pyranose rings came when Sponsler and Dore (1926) realized that Sachse’s mathematical treatment of six-membered rings could be applied to their X-ray structure of cellulose. It was determined that the pyranose ring is puckered, to allow all of the carbon atoms of the ring to have close to the ideal tetrahedral geometry. This puckering leads to a total of 38 distinct basic pyranose conformations: 2 chairs, 6 boats, 6 skew-boats, 12 half-chairs, and 12 envelopes. These conformers can interconvert with one another; however, each form may have very different relative energy, so a significant barrier to interconversion may be present. The energy of these conformations can be calculated from quantum mechanics; an example of possible glucopyranose interconversions is given. The conformations of the pyranose ring are superficially similar to that of the cyclohexane ring. However, the specific nomenclature of pyranoses includes reference to the ring oxygen, and the presence of hydroxyls on the ring have distinct effects on its conformational preference. There are also conformational and stereochemical effects specific to the pyranose ring. Position the ring so that, if looking at the top face, the atoms are numbered clockwise. In the chair and skew conformations, the reference plane should be selected. In the chair conformation, the reference plane is chosen such that the lowest-numbered atom (usually C-1) is exoplanar. In the skew conformation, the plane contains three adjacent atoms and one other with the atom with the lowest possible number exoplanar. As shown by the relative structure energies in the diagram above, the chair structures are the most stable carbohydrate form. This relatively defined and stable conformation means that the hydrogen atoms of the pyranose ring are held at relatively constant angles to one another. Carbohydrate NMR takes advantage of these dihedral angles to determine the configuration of each of the hydroxyl groups around the ring. ^ a b Robyt, J.F. (1998). Essentials of Carbohydrate Chemistry. Springer. ISBN 0-387-94951-8. ^ Ma, B.Y. ; Schaefer, H.F.; Allinger, N.L. (1998). "Theoretical studies of the potential energy surfaces and compositions of the D-aldo and D-ketohexoses". Journal of the American Chemical Society. 120 (14): 3411–3422. doi:10.1021/ja9713439. ^ a b Rao, V.S.R. ; Qasba, P.K. ; Chandrasekaran, R.; Balaji, P.V. (1998). Conformation of Carbohydrates. CRC Press. ISBN 90-5702-315-6. ^ Ionescu, A.R. ; Berces, A.; Zgierski, M.Z. ; Whitfield, D.M. ; Nukada, T. (2005). "Conformational Pathways of Saturated Six-Membered Rings. A Static and Dynamical Density Functional Study". The Journal of Physical Chemistry A. 109 (36): 8096–8105. doi:10.1021/jp052197t. PMID 16834195. ^ Biarns, X.; Ardvol, A.; Planas, A.; Rovira, C.; Laio, A.; Parrinello, M. (2007). 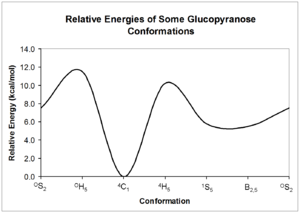 "The Conformational Free Energy Landscape of b-D-Glucopyranose. Implications for Substrate Preactivation in b-Glucoside Hydrolases". Journal of the American Chemical Society. 129 (35): 10686–10693. doi:10.1021/ja068411o. PMID 17696342. ^ Grindley, T. Bruce. "Structure and Conformation of Carbohydrates". In Fraser-Reid, B.O. ; Tatsuta, K.; Thiem, J.; Coté, G.L. ; Flitsch, S.; Ito, Y.; Kondo, H.; Nishimura, S.-i. ; Yu, B. Glycoscience: Chemistry and Chemical Biology I–III. pp. 3–55. doi:10.1007/978-3-540-30429-6_1. ISBN 978-3-540-30429-6. ^ Furhop, J.H. ; Endisch, C. (2000). Molecular and Supramolecular Chemistry of Natural Products and Their Model Compounds. CRC Press. ISBN 0-8247-8201-1. This page was last edited on 5 December 2017, at 08:59 (UTC).